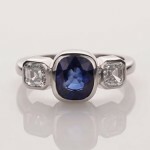 A very fine astrological combination of a very fine cushion cut blue sapphire & two Em cut very fine diamonds set in platinum . In applied astrology this unique ring is for vision, imagination, expressive personality, art, craft, skills, designer, Architect, painter, film director, producer, wealth management, passion, luxuries, life styles, builder, property developer, liquor merchant, creative artist, estate agent, property developer, entertainer and hotelier. This ring is especially important for natives with Lagna of Taurus, Libra, Capricorn & Aquarius for health, stability, defence from any crisis, vision, imagination, creativity, activities, common sense, wisdom, decision making strategy, rise in luck, prosperity, luxuries, life styles, rising, spirituality, profession, status, prestige, honour, career, establishment, peace of mind, properties, assets, savings, power in speech, governing power, strength, confidence & establishment.